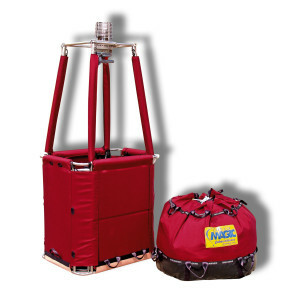 The ultimate light weight 2 person travel pack balloon. • Ultralight weight 50,000 cu ft Tekno 50 envelope weighs less than 50 kg including bag. • Extensively tested fold down composite sided Tekno basket weighs in at less than 35 kg and is capable of flying two people with a range of cylinder configurations. • The basket size is a generous 0.8 x 1.0 x 1.1m high and is equipped with step hole and easy carry handles. • The larger Tekno 70 basket may also be chosen as a cost option with the Tekno 50 package. • The burner which compliments the Tekno 50 package as standard is the hugely successful and innovative Powerplus single designed by Paolo Bonanno and developed in conjunction with Ultramagic. • Option of fast detach burner system from outer burner frame available to allow the burner frame to be packed with the basket and the burner be packed separately. • The Tekno 50 package is equipped with the unique Tekno external tank security system. 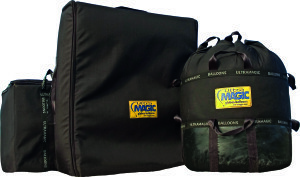 • Padded luggage bags are included for the Tekno basket and burner. • The Tekno basket – Powerplus burner combination can also be supplied with a range of light weight envelope types and sizes as it is approved for use with standard Ultramagic envelopes up to a 77,000 cu ft size. • Lower operating temperatures could result in longer envelope life. • Environmentally friendly and energy efficient technology could help find adequate sponsors. • There is as possibility to take partial advantage of aerofabríx® insulation fabric in top parts only of the envelope.